One of the most exciting stories from Annapolis was that of Kaila Pfrang and Anna Patterson. For a young team, they had some of the best chemistry and work ethic of any other 505 team. They were also one of the few all-female teams on the water. In the Worlds where Angela Stenger and Nikola Birkner became the first all-female team to win a race and break into the top 10, you can see a trend emerging. These are two dedicated, hard-working individuals that will be making waves in their 505 careers. Anna is studying at CNU and Kaila studying at MIT; both are sailing for their respective college teams. I got to know them a little better and learn a bit about the the passion they share for the sport. How long have you known each other and how long have you sailed together? 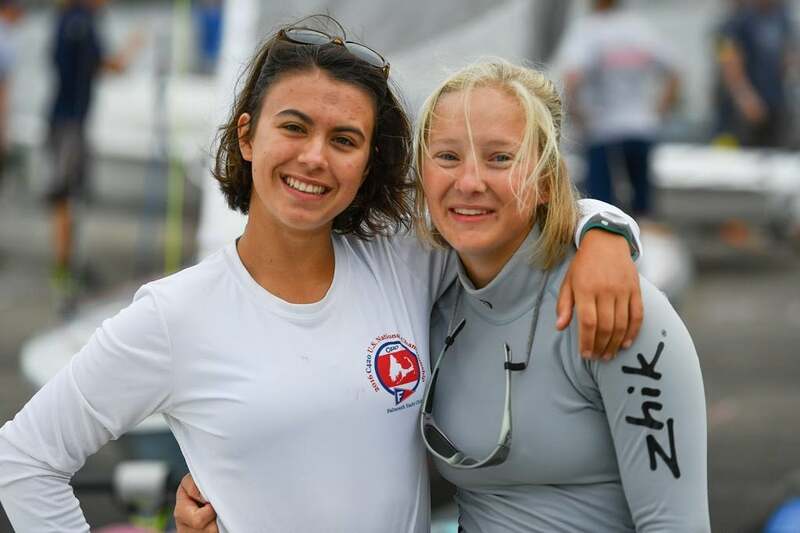 Anna: Kaila and I met in high school when I was a freshman, but we didn’t become close friends until after a summer of sailing for the HYC c420 team. We really bonded after sailing a summer regatta together where we capsized for about 40 minutes, but were determined to get the boat up on our own. We ended up finishing the race smiling, laughing, and singing and we’ve been inseparable ever since. After my knee injury the following year, Kaila got into skippering and I focused more on high school racing. We took every opportunity in high school to go sailing together, but now that we go to schools in different states and have college sailing in our schedules our regattas together are pretty limited. Kaila: I met Anna my very first regatta in high school sailing when my skipper introduced me to her. After that we said hello and chatted briefly over the school year before discovering we’d be on the same race team that summer. We sailed together for one regatta that summer after Anna taught me how to trapeze and sail the spinnaker. After that we went our separate ways both deciding we loved to skipper until I asked Anna to crew for me for a 505 regatta in North Carolina last summer. How did you get started in the 505? Anna: Last summer, a week before I was supposed to go to college, Kaila asked me to come sail a 505 regatta in Wrightsville Beach. I figured it would be a fun last weekend together and a good experience, so I agreed. 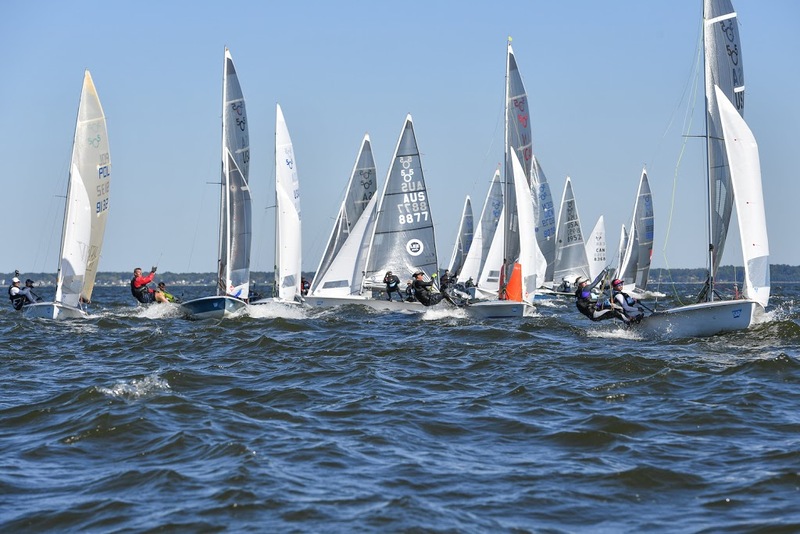 I had a good amount of c420 crew experience, but my first time on a 505 was on our sail out to the race course. The waves were absolutely massive and it was blowing 20-25 kts. It was mildly terrifying and I ended up with a splint on my hand after the spinnaker pole snapped back on it, but I was hooked. Kaila: Tyler Moore approaches me one day about a 505 left at HYC for a few years. He suggested I take a look and see what I might be able to fix. He was very generous in giving me advice and parts and his workshop for space before I finally took it out with a teammate. After our first day out, I was hooked. 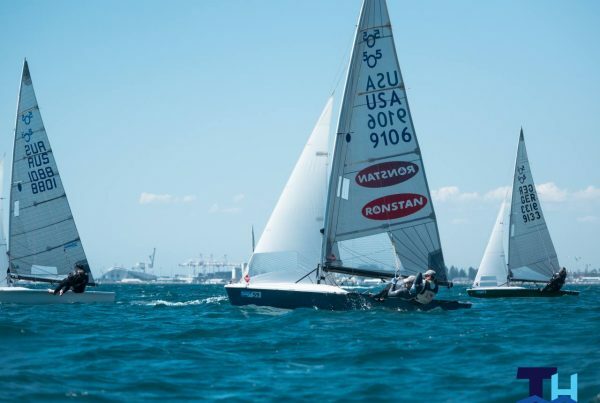 I sailed a few local regattas with the lindsay blue boat with my c420 teammate before deciding I wanted to stick with the class full time. You both sail in college. How does your college experience help you in the 505? Anna: Sailing in college is so different from 505 sailing in most ways, but college has helped me the most with mentally working through tactics and boat interactions. College is such a short course in comparison to the several miles you find on a Worlds course, so everything is on a much larger scale. The combination of college regattas keeping us out on the water all day and our strength and conditioning program has definitely helped with the physical and endurance aspects of the 505. Kaila: The boat handling and practicing with short/tight courses in college sailing translates well into the 5O5 racing in regards to making gains quickly and whether possible. Yet also, while sailing in the notably shiftly Charles River, I have learned a great deal about shifts and keeping the boat flat even through fluke puffs. What do you like about the 505? Anna: The 505 community has been absolutely remarkable. Everyone is very supportive. From lending us a boat (Thanks, Tyler!) to coming up to us at Worlds and offering us a sail (Thank you, Doug!) to constant coaching (Thanks Uncle Henry, Mark, and everyone else), everyone seems to do whatever they can to help us learn about the boat and the class. The physical, mental, and emotional challenge of it is also a huge drawing aspect for me. The high pace of these boats gives me an adrenaline rush that is the best feeling in the world to me. Kaila: Everything. I love the design of the boat (when it isn’t rigged too complicated) and especially the speed and planing ability of the boat. But even more important than the hull shape and racing action, the people in the class make the boat incredible to race. Between the eagerness to help each other and answer questions makes the learning and competing more exciting and friendly. Beyond that though, the 5O5 provides a multitude of invigorating challenges which makes practicing and planing in 8 knots of wind or reaching with the spinnaker in 20 knots something to feel alive for. What does a typical practice day look like? Anna: We honestly don’t get out on the water together as much as either of us likes to. We both worked two jobs this summer and then we left for school. When we did manage to get out on the water, most of the time it was without the HYC group. In this case we did a lot of long upwinds and downwinds just trying to nail down our boat handling. If we can’t find a time to sail together, we try to get on the water with other people from HYC and learn as much as we can. Kaila: Lots of tacks and jibes, acceleration drills, testing new things out. If we have a group we’ll do some speed tests and rabbit drills. The 505 has a very large sail plan. Do you find the power intimidating? Anna: People are shocked that we are sailing the boat, especially together, because of our size and I think this only drives us more. As the crew, it can get pretty intimidating in high winds. I struggle with getting out on the wire in big breeze, specifically on port tack, because of a very messed up left knee and this always proves to make things interesting. I can only push out using my right leg, so the power of the boat in heavy air is the most intimidating to me in this aspect. Kaila: It’s exhilarating, but sometimes when I want to go slow it’s definitely a bit intimidating how large the sail is and how fast the boat always goes. 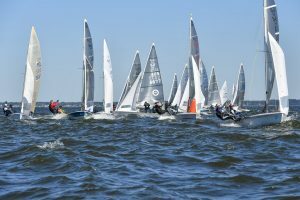 Learning how to utilize the sail plan while keeping the boat flat and fast often proves difficult; yet, as a naturally fast-paced person, I find the power and speed of the boat overall exciting. Your best finish was a respectable 23. Do you remember what you did to get it right? Anna: Our first couple races we really struggled with the large fleet rabbit starts and getting out of the short course mindset. We learned a lot from every race and were working constantly to improve our straight line boat speed. We quickly realized that we lost a lot in maneuvers and we worked on doing what we could to fix that. For me, it was keeping Kaila focused on racing our race and focusing on all of my boat handling and wire work. Kaila: After a few difficult starts of the day our goal was to have one good one and after taking Mark Zagol’s advice about setting up and rig tune off the line, we prepared ourselves. Yet, to be completely honest, I right after the start, I really really badly had to go to the bathroom so my mindset the entire race was to have the fastest boat speed to finish quickly and well. We focused greatly on boat speed and clear air throughout the entire race. After having a decent start, keeping clear was made a bit easier as we worked on maintaining the position. Anna: My family has had such a huge impact on my sailing. My mom has constantly pushed me to not be limited by any health setbacks, including two surgeries on one knee before the age of 17. She has advocated for me endlessly and I cannot thank her enough for her support. Kaila is definitely one of the biggest role models in my life. She is ultimately family to me and I am constantly in awe of her intelligence, dedication, and passion. Also, a quick shout out goes to my coaches, boss, captains, and teammates over the past years who have proved to be some of the most influential people in my life. Kaila: I would say regarding sailing I have three specific role models. My father is one of my biggest when it comes to staying positive and always working hard. Especially when I sail with him, he is always working his best to fix and work with what we make and always looking to take a step forwards mentally and physically in the race. Also, one of my previous C420 coaches, Camilla Marino, is still one of my biggest role models in sailing. As a strong female sailor, she has taught me to be tough and to fight for what I want on and off the water, as well as countless valuable lessons that still run through my mind while racing. Lastly, and very importantly for me during this Worlds event, is Anna. Throughout the past few years of my life, she has been a tremendous best friend and amazing role model as I’ve watched her accomplish so much and always preserve which has truly taught me to work hard while racing and in my everyday life. Anna, what does Kaila do best? One of Kaila’s biggest strengths is her ability to learn from her mistakes and quickly apply corrections. Kaila has also done amazingly well with working to learn how to power the boat to our size. We had the smallest combined weight at any 505 regatta, but she has been able to refine how we need to set up our boat. She is remarkably supportive. I occasionally get frustrated with my physical abilities while we are sailing and she is able to level my head and push me further, even when she is struggling herself. Kaila, what does Anna do best? Anna has a great amount of physical and mental strength which most definitely proves vital when racing the 505. Even when races are physically tough as we battle to keep the boat flat, I watch her grit her teeth, smile, and try even harder. I have certainly never met anyone so determined to do the best she can possibly do which makes working and sailing together absolutely great. Kaila, your beat your dad Christopher, any love lost? Disregarding any places finished, I believe both of our goals was to come to our first worlds and learn valuable lessons. We both had various ups and downs but coming out of the event, we both were proud of our races and have agreed to work even harder to improve. So in the end, as far as I know, no love was lost. What is it like being one of the few female-only teams in the class? The sport is known to be been dominated by males, but we see more and more females coming into the sport through high school and college sailing. It is definitely empowering to be one of the only all-female teams in the class. People are looking to the all-female teams to prove the physical ability for females to sail these powerful boats. We really want to show young women that it is possible to get into these classes and that the power of the boat is not a reason to avoid the class. 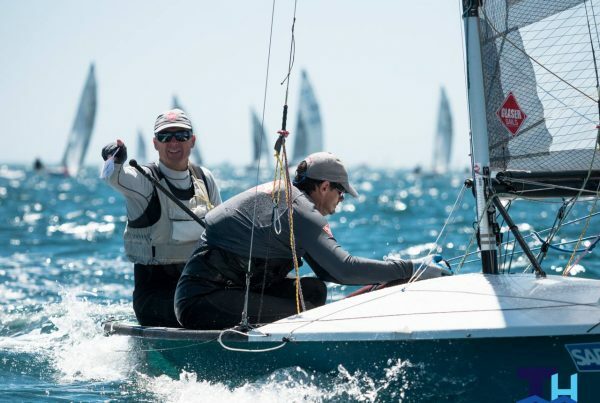 What advice would you have for other young sailors looking to get into the class? Anna: Don’t be afraid to ask questions. This group of sailors is one of the most supportive that I have ever seen. They want to see the class build and grow and the only way to do that is to bring young people in. If you are interested in getting into the class, ask someone to take you out. I guarantee that they would be happy to see some young faces in the boat. Kaila: To piggy-back off of Anna, this class is definitely amazing and helpful in so many ways so never be afraid to ask questions. People are always looking for interested sailors to skipper and crew. If you are excited to learn a lot in a fast paced boat this is definitely the place to be. Do you have any events you are looking forward to next season? Anna: Right now, we don’t have any plans. We are pretty limited in our time together. We both have taken on demanding paths in school combined with college sailing and our summers are dedicated to working to pay for school. If anyone wants to help us out, we would love to make another appearance at Worlds! Kaila: While in Boston during the school year, I most likely will not be able to make any events due to travel expenses and time but hopefully this summer, I’ll be back racing 505’s in Hampton. We both would definitely love to travel to Poland next year for Worlds depending on funding and travel expenses, of course.